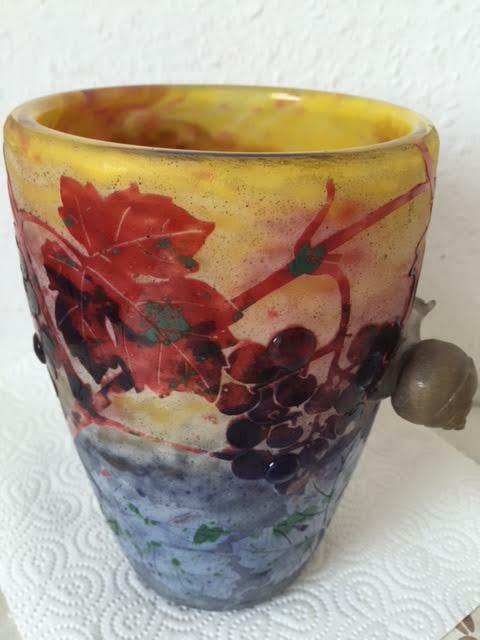 I was offered an important Daum vase by a gentleman who found me through my website. The decoration of applied grapes and snail was just what I was looking for — important, desirable and priced right. I agreed to buy the vase. We met in Manhattan, where we were to consummate the deal. I really wanted this to go well because there would have been a good payday as a result. Another view. Looks great in the photo. Doesn’t it? The first thing I did was to closely inspect the applied snail. If there was going to be a problem, that’s where it was likely to be. The two usual problems are either damage to the antennae or regluing of the entire snail. This was a different problem. The head of the snail looked odd, misshapen and rough. I knew there was a problem from the get-go and was determined to figure it out. On close inspection, I found a seam between the head and the body. (Original snails do not have seams.) Apparently a restorer along the way had removed the entire head (almost certainly due to damage) and replaced it with another, carved to resemble the original. It would easily have passed muster with most people, but I’m not most people. Do you think you would have known if you had purchased this vase? I doubt it. 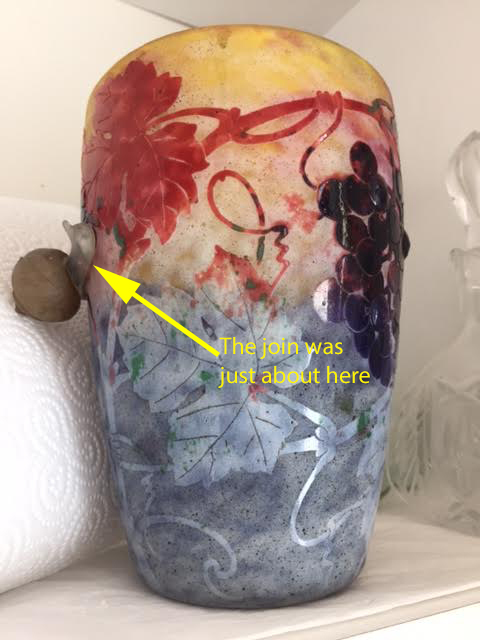 I venture to guess that most people would not have discovered a professional restoration, nor even thought to look for one (and been stuck with the vase as a result). I felt this individual had been duped and wasn’t trying to fool me, as he seemed genuinely surprised at my finding. It was very disappointing to both of us. The good part is you’re not going to buy it. I act like a filter, filtering out fake, repaired, ugly, unimportant, and common items. If I’m offering it for sale, it’s passed my inspection. And that’s why you buy from me. The Denver World Wide Antique Show is close at hand, July 15-17, 2016. If you’re in the area, please make the time to come and visit. In the meantime, we’re very much in business, so call or email me with your wants or items for sale. If you have what I’m looking for, I’m paying the highest prices. My decisions are quick and my payments just as quick. Just snap a photo and email it to me. 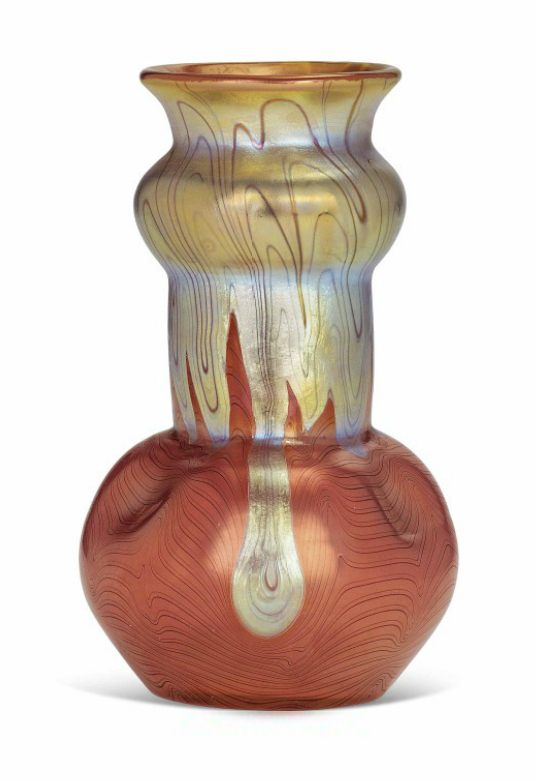 Heritage Auction held a 20th Century Decorative Arts Featuring Art Glass auction on June 24, 2016. I didn’t participate because the quality was quite low overall and the few lots that interested me had condition problems or excessively aggressive estimates. A fairly low percentage of the lots met their reserves and sold. Collectors and dealers today are more discriminating and found little to get excited about in this sale. Besides, June sales are historically weak. The top lot of this section of the sale was #63120, an Edgar Brandt and Daum serpent floor lamp entitled La Tentation (The Temptation). It sold below its pre-sale estimate of $30,000 – $50,000, realizing $25,000, including buyer’s premium. 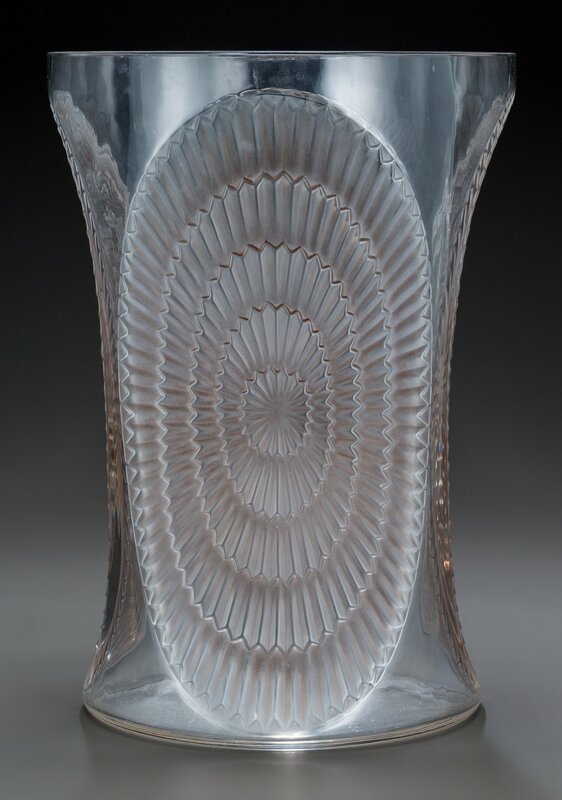 Top lot of the R. Lalique section of the sale was #63277, a rare 1936 vase entitled Los Angeles. It too sold below its low estimate of $10,000, realizing $10,000, including buyer’s premium. No shows until next month, when we’ll be in Denver for the Denver World Wide Antique Show, July 15-17, 2016. In the meantime, we’re very much in business, so call or email me with your wants or items for sale. If you have what I’m looking for, I’m paying the highest prices. My decisions are quick and my payments just as quick. Just snap a photo and email it to me. You remember my story of May 12, 2016, about the Caravaggio painting found in the attic of a private house near the French city of Toulouse? Well something similar happened in Russia in 2012. 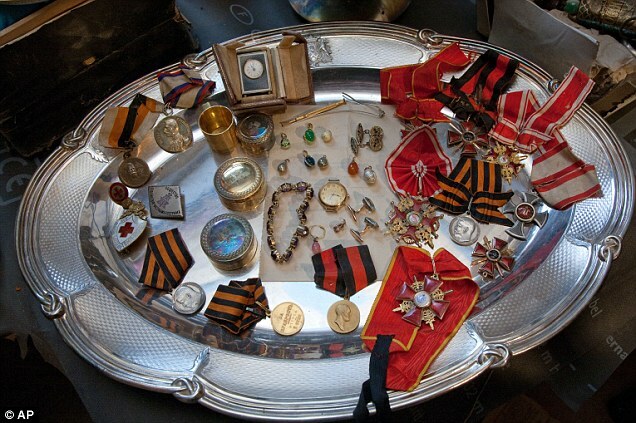 During the restoration of a mansion in St. Petersburg, workers discovered more than 1,000 pieces of jewelry, silver and other treasures in the space between two floors. Click here for the story at the dailymail.com. It’s dated June 15, 2016 (which is why it just caught my attention), but the discovery actually took place in 2012. Here’s the link to the cbsnews.com article, with more information. 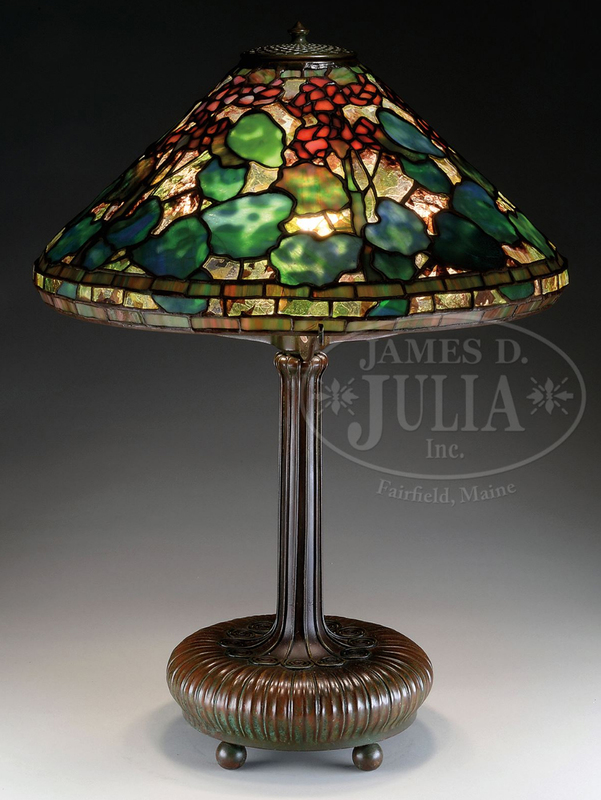 James D. Julia, Inc. held its Important Rare Lamps, Glass & Fine Jewelry auction, June 16-17, 2016, with total sales of approximately $2.5 million. Jewelry, silver, Wedgwood Fairyland Lustre, KPM, Webb, Mt. Washington, non-Tiffany lamps, Steuben and paperweights were sold on the first day. 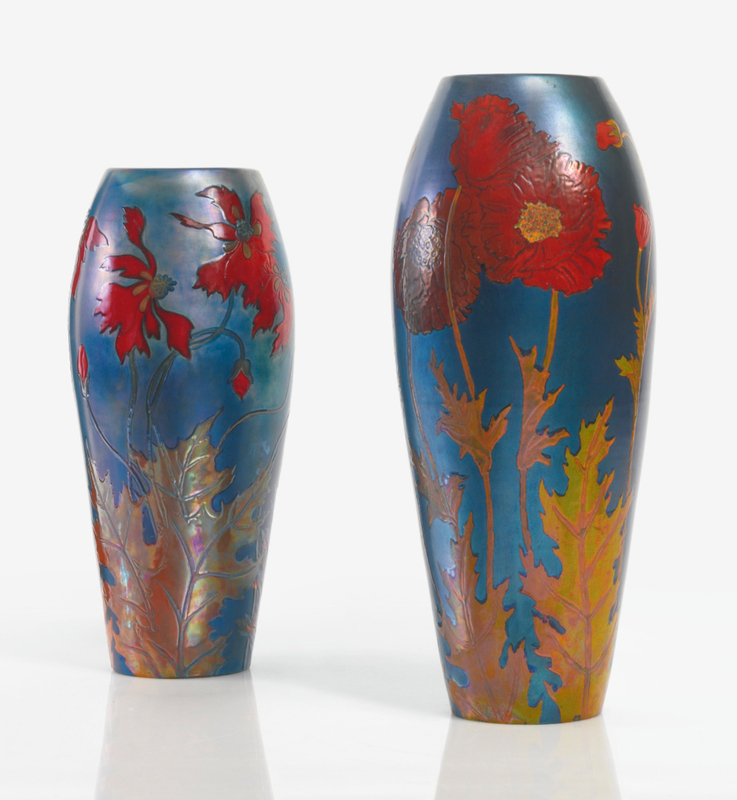 The second day was devoted mostly to Tiffany Studios, Loetz and French cameo glass. 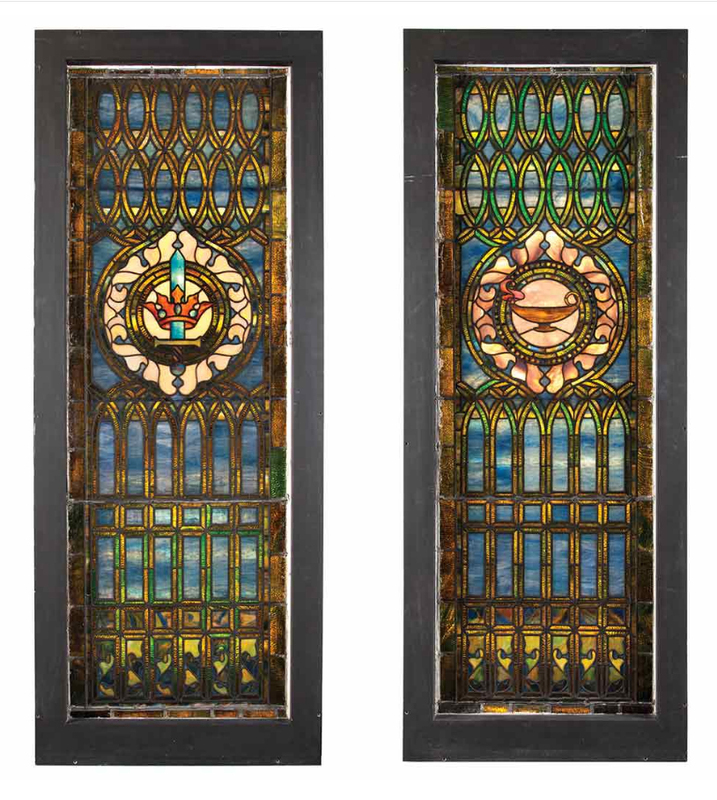 The sale was so large (1,162 lots), that it’s difficult to cover everything in one short blog, so I’ll limit myself to the Tiffany and French glass. 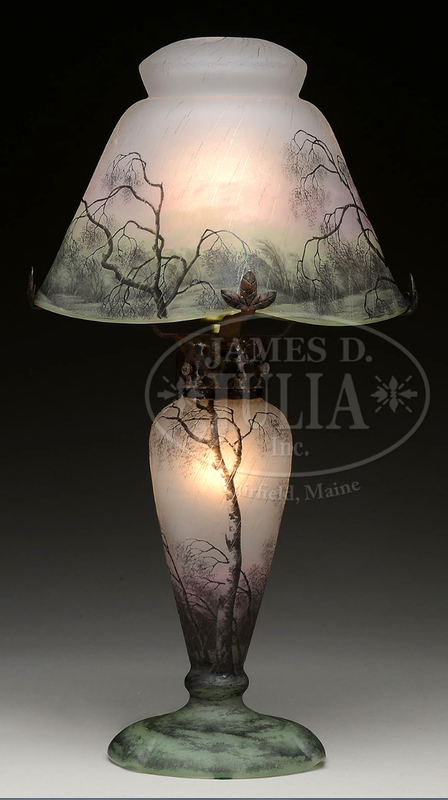 You can view the results of the entire sale in a day or two when Julia’s will post everything. Sales of the Tiffany objects were soft, but there were some bright spots. A rare and beautiful Tiffany Studios 17″ diameter Geranium table lamp sold for $94,800, including buyer’s premium, against a pre-sale estimate of $80,000 – $95,000. Interest picked up considerably when the sale shifted to the French cameo glass section, which included two collections of high quality glass with no reserves. That combination always kicks the excitement level up a few notches. Bids came in from Japan and Russia, as well as all across the US. The strong interest continued throughout the rest of the French cameo glass section. Two lamps did very well, as did most of the Daum glass and some of the Gallé glass, especially blownout vases. A rare Daum Rain lamp sold for twice its low estimate of $10,000, realizing $23,700, including buyer’s premium. It sold to a dealer who is certain he has a client for it. Unfortunately, I was the underbidder. 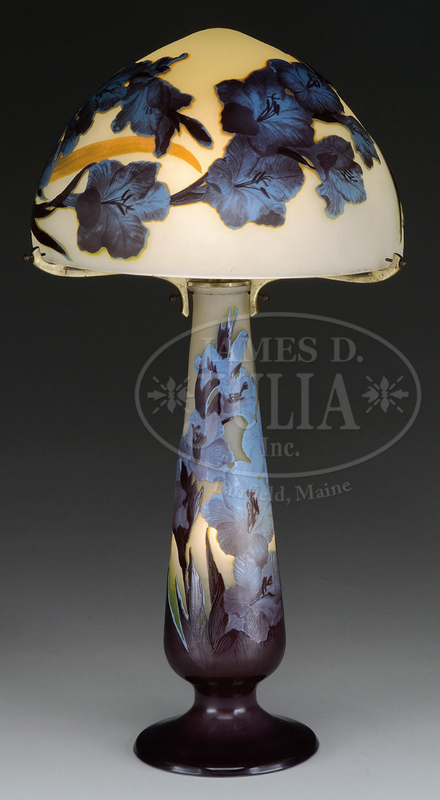 A rare Gallé 4-color lamp with outstanding color and workmanship, lot #2553, sold for a strong $47,400. The consignor was convinced to lower the reserve to $40,000, low enough to entice a buyer in the audience. Personally I had no interest as I felt the pre-sale estimate was too strong at $50,000 – $70,000. For the complete results of the sale, click here. The results should be posted within a couple of days. You will have to sign in (free) to see the prices. Christie’s South Kensington held its Interiors sale on June 8, 2016. Included in the sale was a nice grouping of Loetz vases, some of which did well. 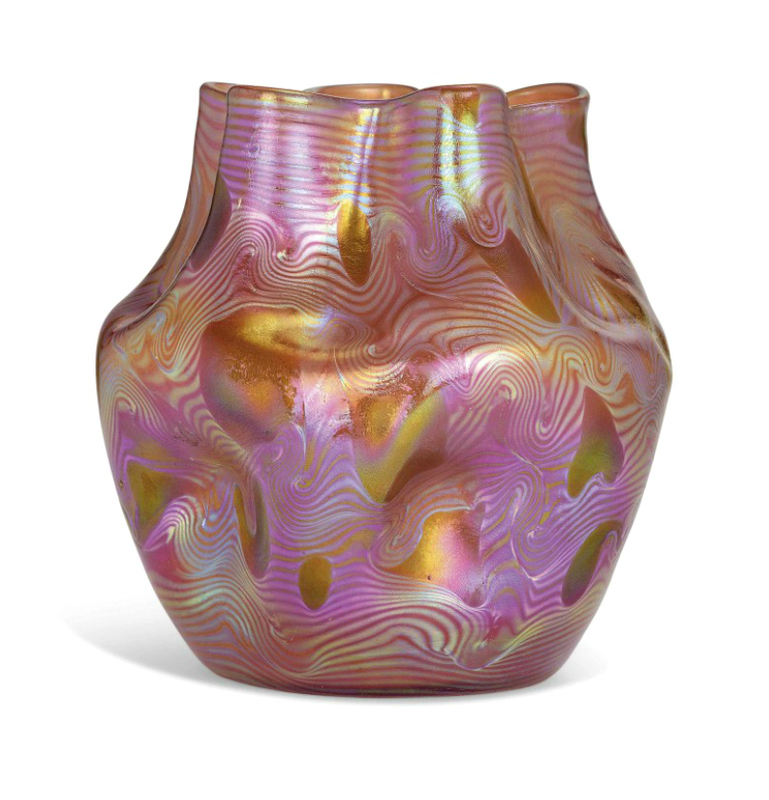 Top lot of the group was #320, a signed, 6½” vase, decorated with iridescent hearts and swirled decoration, in beautiful shades of pink and red. It doubled it’s high estimate of £2,500, realizing £5,625 ($8,173), including buyer’s premium. I thought highly of lot #318. It was signed, but small at 4½” tall. It featured gold iridescent drip decoration over a deep salmon, wave-decorated background. It sold for 50% above its high estimate of £1,800, realizing £2,500 ($3,633), including buyer’s premium. For all of the Loetz results, click here. Doyle New York held its Belle Epoque sale on June 8, 2016, with total sales of $970,913, of which 80% sold by lot and 95% sold by value. Most of the Tiffany Studios objects came from the collection of Julien Cuny, a decorator at Tiffany Studios beginning at age 12 in 1903. 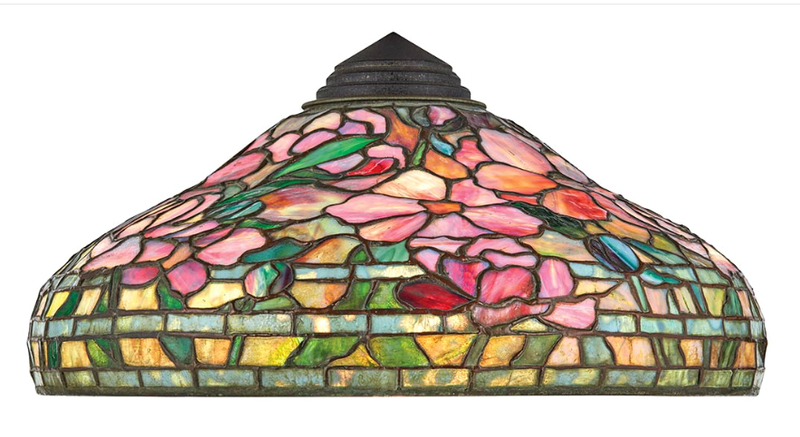 The top lot of the sale was #478, a Tiffany Studios 18″ diameter Peony shade only. It was in excellent, but filthy condition, with an improvised cap. Eventually this shade will be cleaned and reunited with a proper Tiffany Studios base, returning it to the beautiful table lamp it once was. It sold in the middle of its pre-sale estimate of $25,000 – $35,000, realizing $37,500, including buyer’s premium. 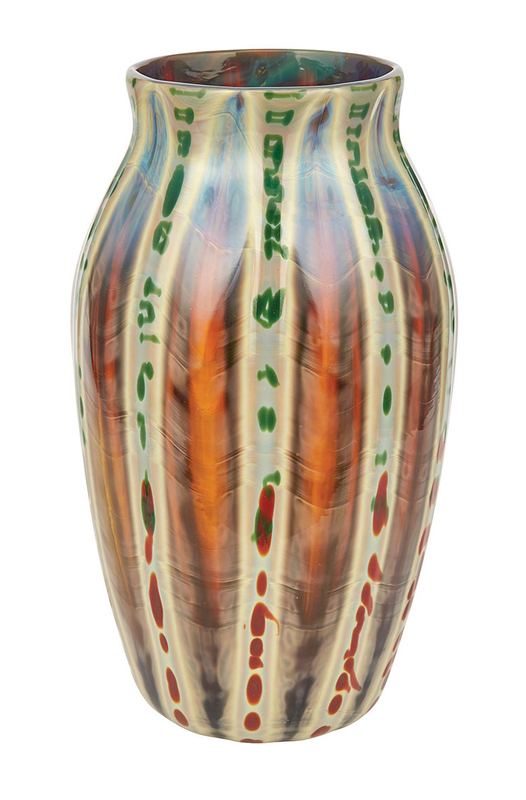 A beautiful and rare Tiffany Favrile Agate vase sold above its high estimate of $15,000, realizing $23,750, including buyer’s premium. 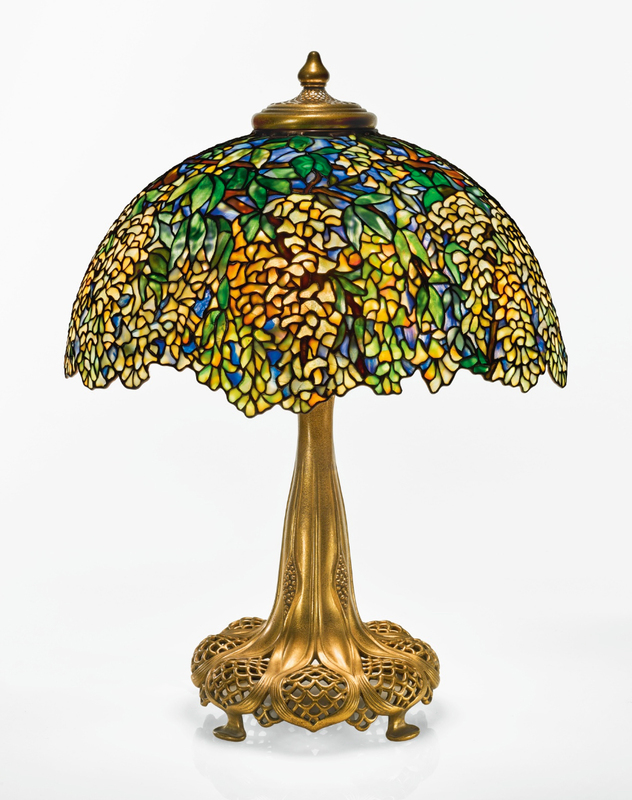 Top lot of the Tiffany Studios group was #35, a Laburnum lamp. It sold at the low estimate of $250,000, including buyer’s premium. The results were soft compared to the December sales, which is usually the case. Cold weather keeps people indoors so they have more time to peruse the Internet and research sales. Martin Brothers stoneware continues to be a bright spot. 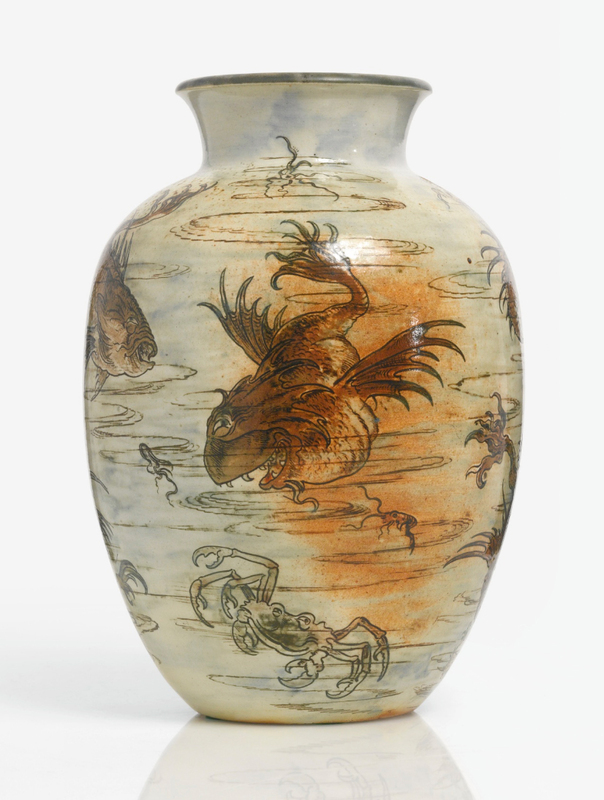 A very nice aquatic vase, lot #44, 11½” tall, dated 1898, sold for $12,500, including buyer’s premium, against a pre-sale estimate of $7,000 – $9,000. I was quite fond of it, but only managed to be the underbidder, not the successful buyer. There are limits to what a dealer can pay. Two large Zsolnay lots, #s 47 and 48, did very well, partly because they had very desirable red decoration. Each sold for well above their high estimates of $12,000 and $15,000, realizing $22,500 and $35,000, respectively, including buyer’s premiums. Rago Auctions held an Early 20th C. Design|Mid-Mod sale on June 4, 2016. The sale included ceramics, furniture and glass, but I will focus only on the French glass. Top lot of the group was #328, a Daum Winter lamp. 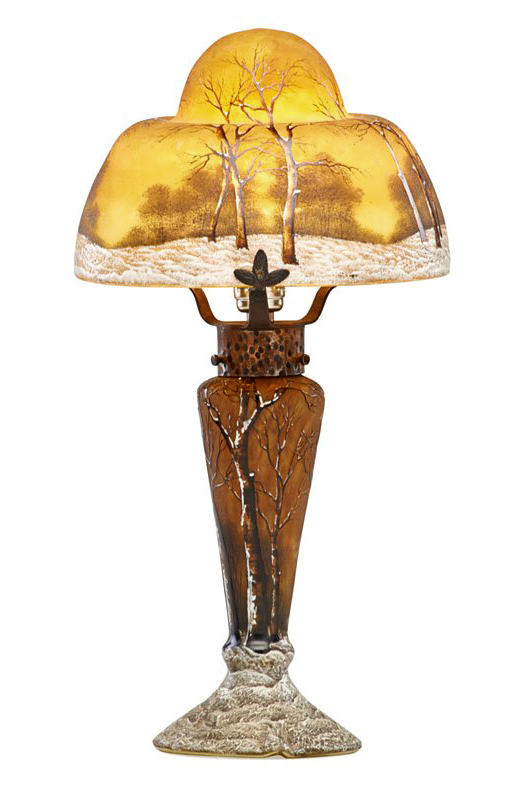 It sold for $13,750, including buyer’s premium, against a pre-sale estimate of $7,000 – $10,000 — surprising to me because the lamp was a marriage. You can see the different color schemes in the shade and base, with bright yellow in the shade and much darker colors in the base. An original lamp would have a matching shade and base. 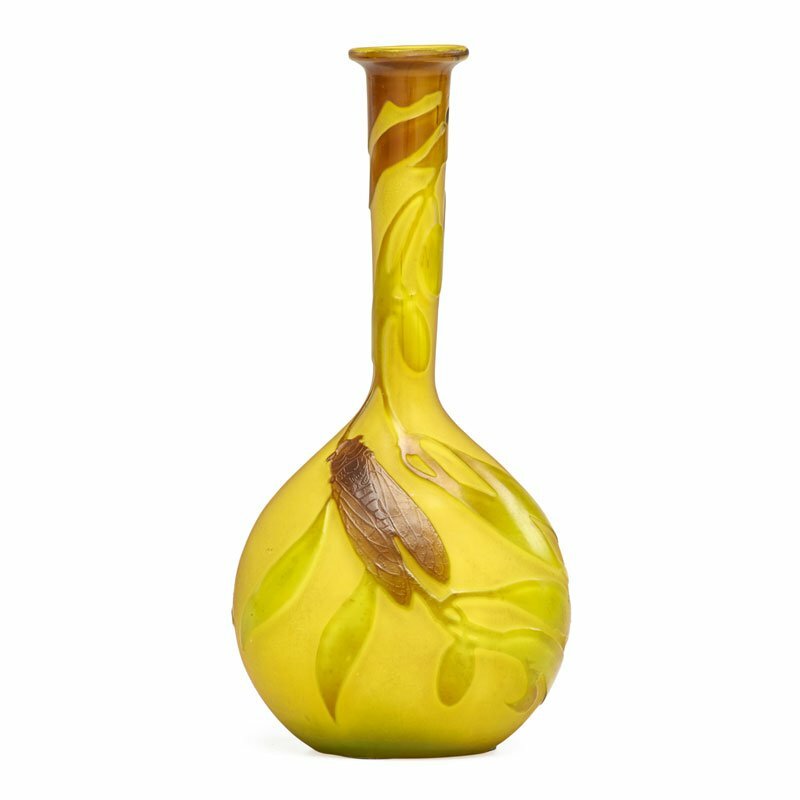 Lot #338 was a rare Gallé banjo vase with a cicada. It sold reasonably for $2,125, including buyer’s premium, against a pre-sale estimate of $1,000 – $1,500. I was the underbidder and should have bid higher, but everything is 20/20 in hindsight. 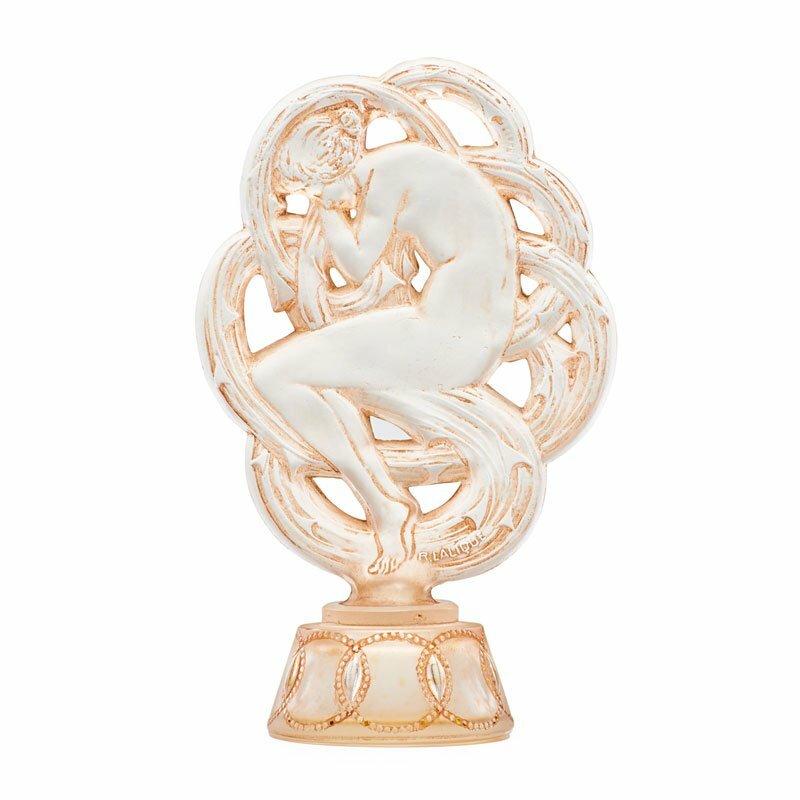 A rare R. Lalique perfume bottle Ambre de Siam, Rago lot #321, sold for $10,000, including buyer’s premium, — below its pre-sale estimate of $10,000 – $15,000. 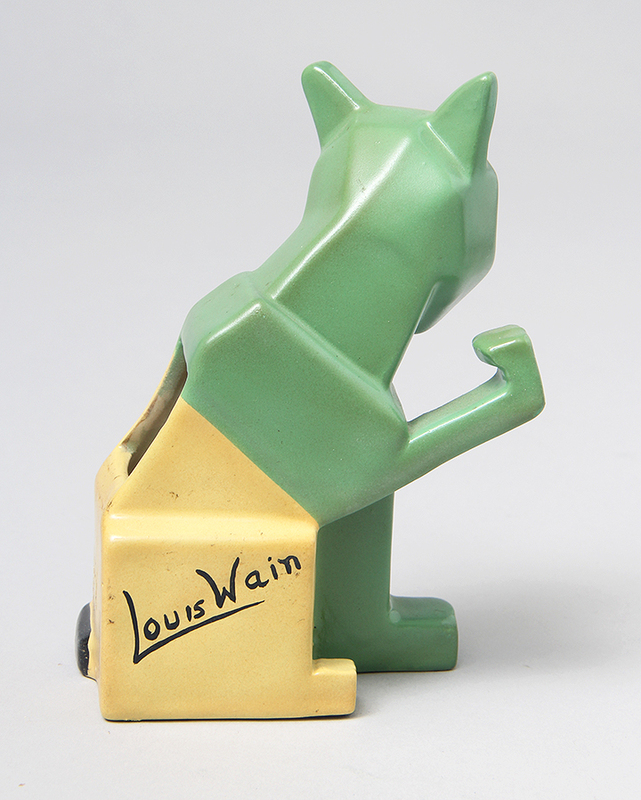 I recently received an email from a collector who proposed selling me a small collection of Louis Wain ceramics. After a bit of negotiating, I bought the group. Cool, right? For those of you who don’t know, Louis Wain was a prolific early 20th century British artist, who started drawing cats as a way to please his dying wife, Emily. Both their cat, Peter, and Louis’ drawings comforted her. She passed away in 1886, but Wain continued to draw cats. Eventually he designed a series of Futurist ceramic cats and other animals that were produced for brief periods, both before and after WWI. His works are moderately rare and highly collectible. I can’t say I’m an expert in the ceramic creations of Louis Wain, but I do know what I like. These Futurist cats tickle me. I buy and sell them whenever the opportunity presents itself, which isn’t very often.